Lodging here can be tricky; demand is high and supply is low which means most places are booked well in advance. Nick's Cove has a handful of cozy cabins (some waterfront) with names like "Uncle Andy's" and "Bandit's Bungalow". Most have wood stoves, claw foot bathtubs and comfy feather beds. Complimentary BBQ oysters (a local specialty) and a fresh continental breakfast make a stay at Nick's feel like a true escape. The attached restaurant is excellent for lunch or dinner with an inventive, seasonal cocktail menu and produce sourced from the on-site garden. Manka's is a 100 year old former fishing and hunting lodge comprised of a few log cabins. Their showpiece is The Boathouse; a waterfront unit boasting the longest dock in Tomales Bay. On Sunday evenings, guests can arrange to have dinner delivered from sister restaurant Sir and Star, which is just as well since you'll be hard pressed to leave this cozy space. Breakfast is delivered fresh to your door every morning (think farm fresh yogurt with house-made granola, or local scrambled eggs with goat cheese) along with a crisp copy of The New York Times. A stay here won't come cheap, but simple luxe touches (like Kiehl's bath products and Frette towels) make it feel extra special. For a longer stay, there a few rentals in the area. The Sea Star Cottage is small, but well appointed with chic details like an orange vintage fridge. The Poet's Loft books well in advance and offers spectacular water views. Inland, Point Reyes Schoolhouse offers homey cabins with access to a bocce court and stunning views of the mountains. Bonus points for being walking distance to Point Reyes Station with shops and restaurants. Tomales Bay is an oyster lovers paradise; bivalves are farmed in the bay and served up at pretty much every restaurant in the area. 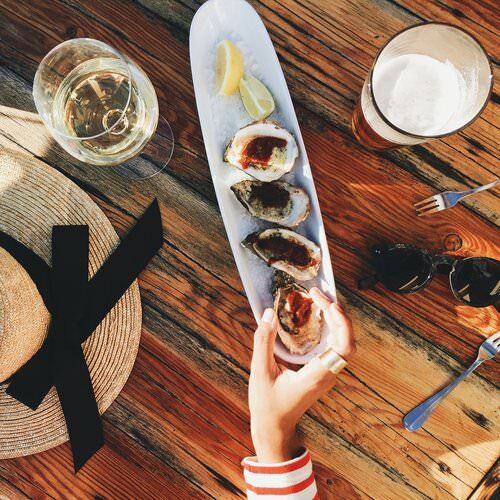 For a true sea to table experience, reserve a picnic table at Hog Island Oyster Company. Picnic tables come complete with charcoal grills, stunning water views and a shucking lesson. Reservations are hard to come by, but walk-ins are welcome (expect a queue on the weekends). Order up dozens of raw or BBQ oysters from the bar (a hulled out boat) and local wine or beer. The Marshall Store is a less DIY affair and has a more robust menu with coastal favorites like clam chowder and fish tacos. Try an order of BBQ oysters (it's fun to compare how each restaurant serves 'em up) and wash them down with an icy cold Scrimshaw. Sir and Star brings fine dining to the area with a menu that reads more like poetry ("The Salmon of Surrounding Seas", anyone?). The interiors are rustic chic with a cozy fireplace for ambiance. Saltwater Depot is located in the blink and you'll miss it town of Inverness and features, what else, local oysters. Ask for a table on the patio when the weather is sunny (it's often not). Stellina in Point Reyes Station is a favorite for housemade pastas and pizza. Take-away is available and is a great option if you're staying at a rental property and don't feel like leaving once the sun goes down (you won't, trust me). Cowgirl Creamery is a Northern California foodie favorite, and it all starts here in a former hay barn. The friendly staff will happily help you create the perfect cheese plate with extras like freshly baked baguettes and fig paste. 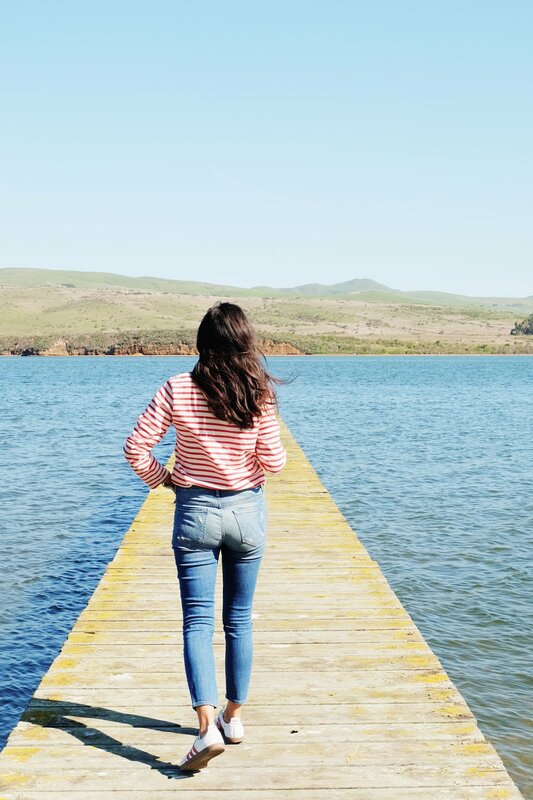 A nautical striped shirt, and a pair of vintage inspired jeans. Cowgirl Creamery offers tours of it's facilities every Friday for $5.00. Point Reyes Outdoor will help you maximize your time outside with a host of activities including naturalist hikes and sea kayaking. Heidrun Meadery offers tours and tastings with no appointment necessary. Point Reyes Arabian Adventures offer reasonably priced horseback riding through various terrain (redwoods, mountains or bay view). The Point Reyes National Seashore is home to the Point Reyes Lighthouse which has stunning, endless views of the Pacific. The lighthouse is worth checking out, but be prepared...the steps leading to it are quite a workout. Cell service is extremely spotty here, so it helps to download any GPS directions before heading out. It gets chilly here at night; bring plenty of layers!